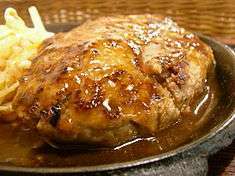 Hamburg steak is beefsteak that is shaped into a patty to be cooked after being chopped. It is closely similar to the Salisbury steak. Made popular worldwide by migrating Germans, it became a mainstream dish in around the start of the nineteenth century. In the early eighteenth century, Hamburg steak was already popular mostly among the Germans, who are claimed to have invented it. 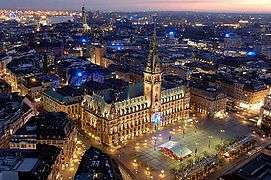 One tale has it that the beef in Hamburg, a German port, was known for being minced and chopped – a method borrowed from the Russians by the German butchers. Another one states that Hamburg steak is an English creation; it is mentioned in the 1745 cookbook Art of Cookery by Hannah Glasse. Migrating Germans introduced the dish worldwide and Hamburg steak became a mainstream dish in nineteenth-century America. The first printed menu in the United States listed Hamburg steak as one of the food items offered; at ten cents, it was the most expensive item on the list. After being wedged between two pieces of bread, the steak evolved into the hamburger. There is a distinction between the terms Hamburg steak and hamburger: The former refers to just a beef patty made a certain way, while the hamburger is a sandwich-like dish comprising the patty, buns and other ingredients including onions. Hamburg beefsteak is made from ground beef or other cheap beef parts. 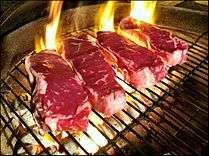 After being chopped, minced, and scraped into a patty, the beefsteak is cooked, either by roasting, frying, or smoking. Eggs, bread, or onions, are sometimes combined with the beef. Mixing milk with the dish is believed to enhance its quality. Hamburg steak is usually seasoned. The steak may also be consumed raw. Hamburg steak is listed by Escoffier as a classic dish in haute cuisine. 1 2 3 4 5 McWilliams 2012, p. 122. ↑ Murphy, Jane (2010). The Great Big Burger Book: 100 New and Classic Recipes for Mouth Watering Burgers Every Day Every Way: Easyread Large Edition. ReadHowYouWant. p. 2. ISBN 9781458764638. ↑ Urbans, Dennis (2005). God Wants You Healthy!. Xulon Press. p. 120. ISBN 9781597814638. 1 2 Hunt, Caroline Louisa (1910). Economical use of meat in the home. Department of Agriculture (United States). pp. 33–. ↑ Blumenthal, Heston (2010). In Search of Total Perfection. Bloomsbury. pp. 195–. ISBN 9781408802441. ↑ Francis, Charles (2009). Wisdom Well Said. Levine Mesa Press. pp. 166–. ISBN 9780982388709. McWilliams, Mark (2012). The Story Behind the Dish. ABC-CLIO. ISBN 9780313385100.